NOTE: - Air temperature must be within 59-вЂќ100 Р’В°F (15-вЂќ38 Р’В°C). during this procedure, - After this inspection, you must reset the engine control module (ECM)/powertrain control module (PCM). Otherwise, the ECM/PCM will continue to stop the fuel injectors from operating. - The battery must be in good condition and fully charged. 1. 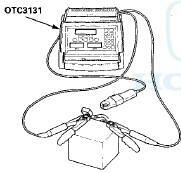 Connect the alternator, regulator, battery & starter tester (OTC3131) to the battery as shown. NOTE: The probe is not used for battery testing. 2. Do the BATTERY TEST. Does the display indicate GOOD or GOOD, LOW CHARGE? YES-The battery is OK. Go to step 3. .
NO-lf the display indicates BAD BATTERY, replace the battery, then retest. If the display indicates CHARGE & RETEST, charge the battery, then retest. 3. Connect the Honda Diagnostic System (HDS) to the data link connector (DLC) (see step 2 on page 11-3).' - 4. Turn the ignition switch to ON (II). 5. Make sure the HDS communicates with the vehicle and the ECM/PCM. If it does not communicate, troubleshoot the DLC circuit (see page 11-181). 6. Select ALL INJECTORS STOP in the PGM-FI INSPECTION menu with the HDS. 7. Set the parking brake, then with the shift lever in N or P (A/T model) or the clutch pedal pressed (M/T model), turn the ignition switch to.START (III) to crank the engine. Does the starter crank the engine normally? - YES-The starting system is OK. Go to step 15. NO-Go to step 8.' , 8. Turn the ignition switch to LOCK (0). 9. Check the electrical connections at the battery, the negative battery cable to the body, the engine ground cables, and the starter for looseness and corrosion, then try cranking the engine again. Does the starter crank the engine normally? YES-Repairi.ng the loose connection corrected the problem. The starting system is OK. Go to step 15. NO-Based on the following symptoms, take the appropriate action:! - If the starter does not crank the engine at all, go to step 10. - If the starter cranks the engine erratically or too slowly, go to step 12. 10. Make sure the shift lever is in N or P (A/T model) or neutral (M/T model), then disconnect the engine wire harness 1P connector (A). Connect a jumper wire from the battery positive terminal to the starter subharness 1P connector (B). Does the starter crank the engine? YES-Go to step 11. 11. Check the following items in the order listed until you find the problem in the circuit: NOTE: After the problem in the circuit is found and repaired, go to step 15. - Check for an open or short in the YEL wire and connectors between the driver's under-dash fuse/ relay box and the ignition switch. - Check for an open or short in the BLK/WHT wire and connectors between the driver's under-dash fuse/relay box and the engine wire harness TP connector. - Check for an open or short in the ORN wire and connectors between the driver's under-dash fuse/ relay box and the clutch interlock switch (M/T model). - Check for an open or short in the LT GRN wire, BLU/WHTwire and connectors between the driver's under-dash fuse/relay box and the transmission range switch (A/T model). - Check for poor ground at G302 (M/T model) or G101 (A/T model). - Check for a faulty ignition switch (see page 22-106). - Check for a faulty clutch interlock switch (M/T model) (see page 4-9). - Check for a faulty transmission range switch (A/T model) (see page 14-238). - Check for a faulty starter cut relay (see page 22-93). 12. Connect the alternator, regulator, battery & starter tester (OTC3131) to the battery. NOTE: The probe is used for starter testing. 13. Do the STARTING TEST. Does the display indicate cranking voltage is greater than or equal to 8.5 V and is the current draw less than or equal to 380 A ? YES-Go to step 14. 14. Remove the starter, and inspect its drive gear and the flywheel ring gear (M/T model) or the torque converter ring gear (A/T model) for damage. Replace any damaged parts. 15. Select ECM/PCM reset (see page 11-4) in the PGM-FI INSPECTION menu to cancel ALL INJECTORS STOP with the HDS.